The development of sponges (Porifera) in ex situ cultivation systems is essential to the progress of researches on pharmacology, biomaterials, biomonitoring and conservation. The aim of this study was to provide a long-term ex situ cultivation condition to obtain a representative sponge biomass growth. Among the four species of marine sponges tested, only Haliclona sp. showed an initial growth. The Haliclona sp. was cultivated in a non-axenic ex situ cultivation system for 14 months. An eutrophic tropical environment was reproduced in an aquarium system. In the growth aquarium, a high biomass of interstitial invertebrates, anemones, macro-algae and bacterioplankton was observed. The orthophosphate represented 93.2% of the phosphate form in the growth aquarium and the nitrate was the predominant form of nitrogen, amounting to 68.2%. Nitrate concentration was about 4-fold higher than that of the sampling station, which can be attributed to high nutrient supply and poor denitrification process. Sponge feeding procedures showed an increase of bacterioplankton density during the water resuspension event with a maximum value of 0.86 × 106 cells mL-1, whereas in the non-blowing situation the density was 0.38 × 106 cells mL-1. Growing morphological structures like the osculum and finger-like branching were observed in the explant of Haliclona sp. during the growth experiment. During the 14 months of this experiment, the sponge showed a continuous growth rate of 54.8% when compared to the initial area of the explant. This study could provide new insights into the cultivation process of marine sponge in laboratory in order to obtain a representative biomass growth to support experimental designs, as well as to other potential applications. Haliclona, Porifera, Sponge cultivation, Sponge growth, Biomaterials, Biomonitoring. The interest in sponge (phylum Porifera) cultivation has increased significantly during the last few decades (Duckworth,2009), mainly because sponges have become an important substrate in biomaterials research (Muller et al. 2009) and an important source of bioactive compounds with pharmaceutical potential (Munro et al. 1999; Osinga et al. 1999; Pomponi, 1999; Rinkevich, 1999; Sipkema et al. 2005; Koopmans et al. 2009; Schiefenhovel & Kunzmann 2012). The majority of promising compounds from sponges have complex structures, thus limiting the viability of synthetic production of the compounds (Sipkema et al. 2005). Moreover, these bioactive compounds are generally present in low concentrations (Unson et al. 1994). This scarcity creates a supply problem, which is a major barrier to the production and use of bioactive compounds from sponges (Belarbi et al. 2003). Ex situ sponge cultivation could solve the supply problem, but carrying out this method remains a challenging task (Duckworth, 2009). The difficulty of achieving long-term sponge biomass growth with constant suitable water quality hampers the use of a high number of replicates of marine sponges in laboratory conditions (Osinga et al. 2001; Belarbi et al. 2003; Osinga et al. 2003; Sipkema et al. 2005; Hausmann et al. 2006; Sipkema et al. 2006; Klöppel et al. 2008; Xue & Zhang, 2009). The complex sponge physiology seems to be the main cause for the unsuccessful cultivation. A balanced system with abundance of nutrients, without the accumulation of toxic waste and the right balance of quantitative and qualitative consortium of microorganisms, is difficult to reach in controlled and semicontrolled cultivation. The aquarium system previously used achieved high initial growth but stabilized after a few weeks. However, a more controlled biotechnological cultivation of sponges is expected to substantially increase growth rates, even compared to growth in natural environments. In the present study, the cultivation of the sponges Desmapsamma anchorata, Amphimedon viridis, Aplysina fulva, Hymeniacidon heliophila and Haliclona sp. was performed in a non-axenic ex situ system with the monitoring of the biotic and abiotic parameters. The aim of this study was to provide a longterm cultivation condition, at least one of the species tested, to obtain a representative sponge biomass growth with potential to support experimental designs. The sponge cultivation was performed in a 170-l glass aquarium which was connected to 40-l water filtration systems, and both were filled with natural seawater collected at Angra dos Reis, Rio de Janeiro, Brazil. The filter system was assembled with 15-l porous ceramics seeded with microorganisms (Stress zyme, Aquarium pharmaceuticals Inc., USA), a skimmer (Morato, Brazil) and a water-return pump (Sarlo better200, Brazil) operating at a flow of 1950 L h-1. The aquarium was equipped with one waterflow pump of 400/1080 L h-1 (Sarlo Better mini, Brazil). Moreover, this system also contained an automated salinity-regulation device which consisted of a level float and a water pump that supplied the aquarium with distilled water. The total sediment substrate had a height of 6.5 cm and contained a mix of 70% aragonite and 30% thin white beach sand with 2 cm laid over an anaerobic compartment. The lighting was uninterrupted (without day/night simulation) being performed by a system of one 110 w UV-protected halogen metal-halide lamp (Aquastar, Germany), two 30 w cold lamps enriched in blue wave (Marine Glo, Japan) and one 15 w cold lamp (Aquastar, Germany). The water temperature was regulated by the room temperature, which was kept constant at 18°C. The marine organisms were collected in Angra dos Reis, Rio de Janeiro, Brazil during March-June of 2008. Transportation to the laboratory lasted for 4 hr, during which time they were kept in abundant seawater, before being transferred to the growth aquarium. Initially, small fragments of rocks encrusted with microorganisms, invertebrates and algae (about 5 cm) were progressively introduced into the growth aquarium until its conditions stabilized (after three months). The growth aquarium was assumed to be stabilized when a massive flora and fauna was living healthily and without detectable fluctuations of ammonium, nitrite and nitrate concentrations. After this step, sets of rock substrate attached with Desmapsamma anchorata, Amphimedon viridis, Aplysina fulva and Haliclona sp. (about 3.5 cm) were progressively introduced into the growth aquarium. This procedure was repeated several times until at least one of the species achieved constant growth. During the 14 months of sponge growth experiment no substantial amount of artificial seawater was replaced in the aquarium. During the stabilization period, ammonia, nitrite, nitrate, temperature, salinity and pH parameters were monitored daily, before the feeding processes, using commercial colorimetric kits (Nutrafin-Hagen, Tetratest, Merck, Germany), a mercury thermometer of 0.1ºC resolution, a portable refractometer (Master-53T, Atago, USA) and a digital pH meter (HPM-102, Homis, Brazil), respectively. After the stabilization period, these parameters were monitored weekly. Moreover, during the last three months of recorded sponge growth, a more accurate analysis of water quality, in which important set of parameters were included, was performed in accordance with standard of oceanographic methods (Grasshoff et al. 1999). The chlorophyll a analyses were performed after vacuum filtration (<25 cm Hg) on 0.45 μm cellulose membrane filters (HAWP, MF-Millipore, USA). The extracted material was kept overnight in 90% acetone at 4°C and analyzed with a UV-VIS spectrophotometer (Lambda 20, Perkin Elmer, USA). The inorganic nutrients were analyzed as follows: i) ammoniacal nitrogen by indophenols; ii) nitrite by diazotization; iii) nitrate by reduction in a Cd-Cu column followed by diazotization; iv) total nitrogen by digestion with potassium persulfate following nitratelevel determination; v) orthophosphate by reaction with ascorbic and molybdic acids; vi) total phosphorous by acid digestion following reaction with ascorbic and molybdic acids; vii) silicate by reaction with molybdate. The iron level was determined by colorimetry using an analytical kit (ref. 21057-69, HACH, USA). The sponges were fed by two procedures to increase the food availability. The first strategy was performed by the daily mechanical resuspension of the organic matter accumulated over the growth aquarium sediment. The device employed to vortex the water was intentionally used to stress the large quantity of anemones inside the aquarium, forcing them to expel incompletely digested food, digestive mucous and microorganisms. The second feeding strategy was performed by disabling the water pumps and covering the sponges with fish-food flakes (Tetracolor Tropical Flakes, Tetra, Germany) for 4 hours. Posteriorly, the flakes were removed from the sponges with blowing water and were then consumed by other organisms of the aquarium. The anemones were mechanically stressed at this time as well. The amount of flakes was varied in accordance with the increasing quantity of sponge biomass. When the sponge culture was still small, they were actively fed every day with 2 g of fish-food flakes. However, when the sponges grew larger, the quantity of fish-food flakes used increased significantly to 18 g and the feeding frequency was changed to twice a week. The debris at the bottom of the aquarium was removed twice during the experiment (14 months). The surface sediment was aspirated, discharged and replaced with the equivalent volume of new natural seawater and a new sand/ aragonite mixture. Anemones, sea urchins, crabs and gastropods were individually counted. The estimation of the macroscopic interstitial fauna population was made by the polychaetes and nematodes counting in 250 mg of sampled sediment. The triaged macroscopic interstitial fauna was fixed in Bouin′s solution for 4 h, preserved in 70% ethanol and then submitted to a manual counting. The abundance of the green macroalgae and the filamentous macroalgae was calculated based on the biomass wet weight. The total bacterioplankton abundance was determined by flow cytometry twice after a significant period of growth recording (14 months). The procedure was performed in accordance with Gasol & del Giorgio, and Andrade et al. In brief, prokaryotic nucleic acid was stained with 2.5 μmol. l-1 fluorochrome SYTO-13 (Molecular Probes, Eugene, USA) and, subsequently, the samples were fixed with sterile 2 % paraformaldehyde. The counts were performed in a CyAn ADP flow cytometer (Dako, USA) equipped with a solid-state laser (488 nm, 25 mW) and filter modifications (green FL1 to 510 ± 15 nm and red FL4 to 650 ± 10 nm). The fluorescent latex beads (1.58 μm diameter) were systematically added for the calibration of the side scatter and green fluorescent signals were added also to be used as an internal standard. The sponge growth was estimated based on the sponge’s area increment in sequential photos collected monthly at a fixed position (Stylus 770 SW, Olympus, Japan), as previously described (De Caralt et al. 2003; Hausmann et al. 2006; Xue & Zhang, 2009). The sponge areas in each photo were calculated using the software Image J (Image Processing and Analysis in Java, version 1.41). The growth aquarium showed six groups of macroinvertebrate community representatives. Furthermore, this ex situ system supported a high algal biomass (Table 1). *Nematodes density in the sampled aquarium sediment. **Total individuals present in the growth aquarium. Table 1: Growth aquarium biodiversity. Among the macroinvertebrates found, the polycaetes and anemones were most abundant. The family Cirratulidae was the most abundant interstitial invertebrate found in the growth aquarium followed by Arenicollidae and Anphinomidae. The anemones presented themselves distributed across the rock substrate of the growth aquarium with predominance of the Actiniidae family. The cirratulids specimens were obtained only near the upper layer of the aquarium sediment. During the experiment 600 and 500 g of wet weight of Ulva fasciata and Bryopsis corymbosa, were recorded respectively. This high algal biomass provided a suitable substrate for the occurrence of the amphipoda belonging to the Hyalidae family, which was the most numerous among of Crustacean. In the table 2 the results of the dissolved organic material and the inorganic parameters are presented. The values obtained were compared with typical aquarium conditions for coral cultivation (Atkinson & Crow, 1995) and with the water physico-chemical features from an area near the sampling station (Mayer-Pinto & Junqueira, 2003). The orthophosphate concentration of the growth aquarium water was very similar when compared with the one in the area near the sampling station. The orthophosphate represented 93.2% of the phosphate form in the growth aquarium and the nitrate was the predominant form of nitrogen, representing 68.2%. The nitrate and phosphate nutrients were higher in the growth aquarium when compared with the sampling station (table 2). The nitrate was about 4-fold higher than the concentration from the sampling station (table 2). The elevated nitrate concentration can also be found in a typical coral aquarium (Atkinson & Crow, 1995). The elevated concentration of this parameter in the closed-systems can be attributed to the high nutrient supply and poor denitrification process. Phaeophytin is assumed as indicator of chlorophyll degradation because it is chlorophyll lacking a central Mg2+ ion. This concentration is higher than the chlorophyll, indicating turnover of photosynthetic organisms. *Atkinson & Crow, 1995 **Mayer-Pinto & Junqueira, 2003 (Anil Beach). The data obtained from the growth aquarium represent a median value with the respective standard deviation (n=12 performed in triplicate). Table 2: Physico-chemical characterization of the growth aquarium and comparison among a typical coral aquarium and the organisms sampling site. To check the increase of bacterioplankton in the growth aquarium during the water resuspension event, we carried out a bacterial density analysis (n=4) in the blown aquarium water after 14 months of growth recording. The experiment was performed in the total of 120 minutes where the bacterial density showed a maximum median value of 0.86 × 106 cells mL-1 immediately after the blowing moment (minute 0), and a decrease during the experiment time (Figure.1). 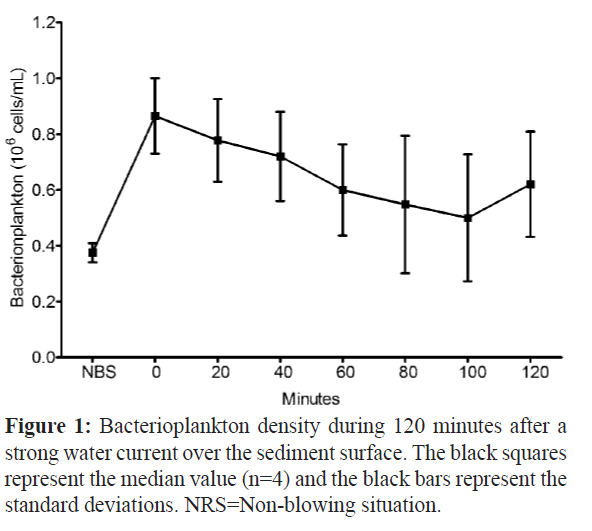 Figure 1: Bacterioplankton density during 120 minutes after a strong water current over the sediment surface. The black squares represent the median value (n=4) and the black bars represent the standard deviations. NRS=Non-blowing situation. After the blowing event, the turbidity of the growth aquarium increased and the visibility was less than 10 cm. The density at 100 minutes presented the lower median value of 0.50 × 106 cells mL-1, whereas in the non-blowing situation the density was 0.38 × 106 cells mL-1. Four species of marine sponges were tested in the cultivation system proposed in this study. All of the tested specimens of Desmapsamma anchorata died due to necrosis during the first week of adaptation. The samples of Amphimedon viridis and Hymeniacidon heliophila either maintained their small biomass fragment or lost it progressively until dying during the adaptation period. Among the four species tested, only Haliclona sp. fragment showed an initial growth with development of the osculum. In addition, finger-like branching structure growing in the Haliclona sp. were also observed (Figure 2). Figure 2: Haliclona sp. displaying osculum (red circles) and finger-like branching structure growing (yellow circles). The period required to observe these structures was one month after the introduction of rock substrate attached with the sponge's fragments. The growth of the Haliclona sp. explant was recorded five times in the fifth, ninth, twelfth and fourteenth months of the experiment (Figure 3). The five records presented a decreased time interval ranging from five, four, three and two months, respectively. Figure 3: Recorded Haliclona sp. growing. A=Development of the projection area of the explant. B = Photographs of the explant during the growing experiment at the time of replaced to the flat surface of the grained sediment (0) , 5, 9, 12 and 14 months later. A continuous growth of the explant was observed during the 14 months. However, growth rate was not uniform. The highest growth rate was 26%, recorded in the first five months. Between the fifth and ninth months (four months' interval) an increase of 13.3% was recorded. The lowest growth was 1.2%, recorded between the ninth and twelfth month (three months' interval). However, the last record, with an interval of two months, presented an increase of 14.3%. Furthermore, after 14 months of experiment the total growth was 54.8% when compared to the initial area of the explant (Figure 3). Despite the continuous growth, some degeneration and tissue-healing areas were observed between the tenth and twelfth months, which can explain a lower growth recorded during the experiment. In this study we performed a cultivation of marine sponge Haliclona sp. in an ecologically inspired ex situ system for 14 months. An eutrophic tropical environment was produced in the aquarium system. In the growth aquarium a high biomass of interstitial invertebrates, anemones, macro-algae and bacterioplankton was observed. The distribution of anemones across the rock substrate suggests a good circulation of dissolved oxygen and organic macroparticles in the water column. Furthermore, the high occurrence of cirratulidae specimens can also indicate a good oxygen supply to the superficial layer of the sediment and a deficiency of oxygen in the lower layers. The vertical distribution of macrofauna within the sediment column appears to be regulated in part by oxygen and sulphide concentrations (Levin, 2005). The lower layer was composed of 30% (2 cm) of thin sand, which is able to create an anoxic condition, important to provide denitrification process. Furthermore, the predominance of the family cirratulidae can indicate that this ex situ system presented abundance of sediment bioavailable organic matter. In fact, some cirratulids have been described as indicators of organically enriched sediments (Elías et al. 2004). The algal biomass present in the growth aquarium can be related to the bioavailability of nutrients present in the water, especially by the high concentration of orthophosphate and nitrate. The elevated concentration of nutrients present in this closedsystem can be attributed to the high quantity of fish food furnished and to a poor denitrification process. During the experiment 1.100 g of the algal biomass were recorded, distributed in 170 L of water in the aquarium (6.47 g L-1), where the excess was removed periodically to maintain uniform the flow of water and to avoid excessive proliferation of decomposing microorganisms. The rapid proliferation of algal biomass in the growth aquarium, especially of the Ulvaceae family, allied to high nutrient concentrations, suggest that this closed-system can be characterized as eutrophic environment. In fact, the genre Ulva has been used as a convenient bioindicator of eutrophication in the aquatic environments (Yokoyama & Ishihi, 2010). In this work we adopted two approaches to sponge feeding based on the bacterioplankton availability. The first one was based on the bacterioplankton growth stimulation by organic and inorganic nutrients supplied by the fish-food flakes, which were directly placed on the sponge. Sponges efficiently retain particles, such as phytoplankton, bacterioplankton, heterotrophic eukaryotes, detritus and dissolved materials (Ferguson, 1982; Reiswig, 1990; Pile et al. 1996, Pile et al. 1997; Leys & Reiswig 1998; Osinga et al. 2001; Belarbi et al. 2003; Osinga et al. 2003; Sipkema et al. 2006). In fact, the proximity of the flakes to the surface of the sponge may have contributed both to the efficient bacterioplankton (bacterial decomposition of the flakes) and to the fish-food nutrients absorption during the sponge feeding (i.e. vitamins, essential metals and carotenoids). Moreover, this approach could also be contribute to sponge associated microorganisms and, consequently, further sponge development. The sponge-associated microorganisms are in close association with sponges which comprise an important sponge biomass (about 40-60% of the mesohyl in certain sponges) (Vacelet, 1975; Taylor et al. 2007; Isaacs et al. 2009; Selvin et al. 2010). The second approach was performed by blowing aquarium water, containing fish-food flakes, which create strong water current over the sediment surface, to provide an increase of food availability. In addition, the water current provided a stress condition for anemones, which expelled digestive mucus rich in microorganisms, thereby increasing the amount of bacterioplankton in the growth aquarium. This sponge feeding approach can be an important way to contribute to the food diversity for the cultivation of this organism in an aquarium as previously suggested by Duckworth & Pomponi, (2005). Moreover, the average value found in this experiment is comparable to those previously observed in tropical coastal waters (Vieira et al. 2007), which can reproduce similar availability of bacterioplankton condition for this tropical species in the aquarium. During the 14 months of this experiment the Haliclona sp. showed a continuous growth, even though it did not present a uniform rate. Growing morphological structures like the osculum and finger-like branching were observed in the explant of Haliclona sp. during the growth experiment. The osculum presence can be considered a good health indicator because it suggests sponge filtering activity with tissue organization, as expected in functional sponges (Hausmann et al. 2006). Besides the possible influences on the growth of Haliclona sp. already reported, regarding the nutrient-rich environment, the highest growth recorded in the first five months (26%) coincides with a greater presence of silicate in the growth aquarium (personal data). High concentration of silicate (or ferric ions) induces spicule formation and leads to construction of the aquiferous system together with the formation of the exhalant osculum (Kaandorp et al. 2008). In this sense, a greater presence of silicate in the water could lead to higher growth in the explant. 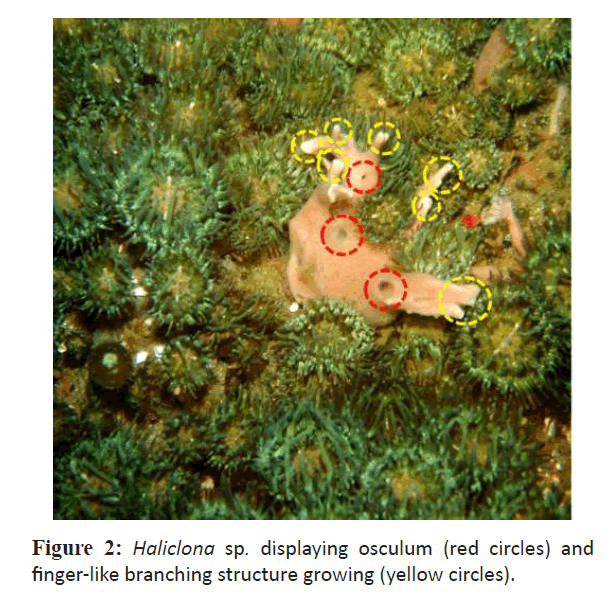 However, more detailed investigations should be conducted to elucidate the relationship of these and other nutrients in the growth of Haliclona sp. The 54.8% increase in area of the explant Haliclona sp. with biomass increment was enough to support an experimental design involving the exposure of the explant to cadmium for several times for the identification of differential protein expression in a stress situation (Wanick et al. 2013). The biomass generated was sufficient both to determine the concentration of cadmium in the tissues and for the extraction of proteins submitted to twodimensional gel electrophoresis at different exposure times. Despite the need for further investigation of the relationship between the nutrients and the growth of the sponge in the closed system, this study was able to provide new insights into the cultivation process of this organism in the laboratory to obtain a representative biomass growth in order to support experimental designs, as well as to other potential applications. We are especially thankful to Prof. Dr. Roberto Gonçalves Ramalho from Instituto Federal do Rio de Janeiro - IFRJ for providing technical support on the English language. Andrade, L., Gonzalez, A.M., Araujo, F.V., Paranhos, R., (2003).Flow cytometry assessment of bacterioplankton in tropical marine environments, Journal of Microbiological Methods,55(3):841-50.doi:10.1016/j.mimet.2003.08.002. Atkinson, M.J., Carlson, B., Crow, G.L., (1995). Coral growth in high-nutrient, low-pH seawater:a case study of corals cultured at the Waikiki Aquarium,Honolulu, Hawaii, Coral Reefs,14(4):215-223.doi:10.1007/BF00334344. Belarbi, E. H., Contreras, A.G., Chisti, Y., García, F.C., Molina, E.G., (2003). Producing drugs from marine sponges, Biotechnology Advances,21(7):585-98.doi:10.1016/S0734-9750(03)00100-9. De Caralt, S., Agell, G., Uriz, M.J., (2003). Long-term culture of sponge explants: conditions enhancing survival and growth, and assessment of bioactivity, Biomolecular Engineering, 20(4-6):339–347.doi:10.1016/S1389-0344(03)00045-5. Duckworth, A.R., Pomponi, S.A., (2005). Relative importance of bacteria, microalgae and yeast for growth of the sponge Halichondriamelanadocia (De Laubenfels, 1936): a laboratory study, Journal of Experimental Marine Biology and Ecology, 323(2):151–159.doi:10.1016/j.jembe.2005.03.007. Duckworth, A., (2009). Farming Sponges to Supply Bioactive Metabolites and Bath Sponges: A Review.Marine Biotechnology (NY),11(6):,669-679.doi:10.1007/s10126-009-9213-2. Ferguson, J.C., (1982). A comparative study of the net benefits derived from the uptake and release of free amino acids by marine invertebrates, The Biological Bulletin Marine Biological Laboratory Woods Hole, 162:1–17. Gasol, J.M., Del Giogio, P.A.,(2000). Using flow cytometry for counting natural planktonic bacteria and understanding the structure of planktonic bacterial communities, Scientia Marina, 64(2):197– 224.doi:10.3989/scimar.2000.64n2197. Grasshoff, K., Kremling, K., Erhardt, M., (1999).Methods of seawater analysis. Wiley–VCH Verlag, Germany. Hausmann, R., Vitello, M.P., Leitermann, F., Syldatk, C., (2006). Advances in the production of sponge biomass Aplysinaaerophoba-A model sponge for ex situ sponge biomass production, Journal of Biotechnology, 124(1):117-127.doi:10.1016/j.jbiotec.2006.03.033. Isaacs, L.L.T., Kan, J., Nguyen, L., Videau, P., Anderson, M.A., Wright, T.L., Hill R.T., (2009). Comparison of the bacterial communities of wild and captive Sponge Clathriaprolifera from the Chesapeake Bay, Marine Biotechnology,11(6):758-770.doi:10.1007/s10126-009-9192-3. Kaandorp, J.A., Blom, J.G., Verhoef, J., Filatov, M., Postma, M., Müller,W.E.G.,(2008).Modelling genetic regulation of growth and form in a branching sponge, Proceedings of the Royal Society of London B,275(1651):2569-2575.doi:10.1098/rspb.2008.0746. Klöppel, A., Pfannkuchen, M., Putz, A., Proksch, P., Brümmer, F., (2008). Ex situ cultivation of Aplysinaaerophoba close to in situ conditions: ecological, biochemical and histological aspects, Marine Ecology, 29(2):259-272.doi:10.1111/j.1439-0485.2008.00225.x. Levin, L. A., (2005). Ecology of cold seep sediments: Interactions of fauna with flow, chemistry and microbes, Oceanography and Marine Biology: An Annual Review,43:1-46. Leys, S.P., Reiswig, H.M.,(1998). Transport pathways in the neotropical sponge Aplysina, The Biological Bulletin, 195(1):30-42.doi:10.2307/1542773. Mayer-Pinto, M., Junqueira, A.O.R., (2003). Effects of organic pollution on the initial development of fouling communities in a tropical bay, Brazil, Marine Pollution Bulletin,46(11):1495–1503.doi:10.1016/S0025-326X(03)00249-2. Müller, W.E.G., Wang, X., Cui, F.Z., Jochum, K.P., Tremel, W., Bill, J., Schröder, H.C., Natalio, F., Schlossmacher, U., Wiens, M., (2009).Sponge spicules as blueprints for the biofabrication of inorganic-organic composites and biomaterials, Applied Microbiology and Biotechnology,83 (3):397-413.doi:10.1007/s00253-009-2014-8. Munro, M.H.G., Blunt, J.W., Dumdei, E.J., Hickford, S.J.H., Lill, R.E., Li, S., Battershill, C.N., Duckworth, A.R., (1999). The discovery and development of marine compounds with pharmaceutical potential, Journal of Biotechnology,70(1-3): 15-25.doi:10.1016/S0168-1656(99)00052-8. Osinga, R., Tramper, J., Wijffels R.H., (1999). Cultivation of marine sponges, Marine Biotechnology,1(6):509-532.doi:10.1007/PL00011807. Osinga, R., Kleijn, R., Groenendijk, E., Niesink, J.T., Wijffels R.H., (2001). Development of in vivo sponge cultures: particle feeding by the tropical sponge Pseudosuberitesaff. andrewsi, Marine Biotechnology, 3(6):544–554.doi:10.1007/s1012601-0078-2. Osinga, R., Belarbi, E.H., Molina, E.G., Tramper, J., Wijffels, R.H.,(2003). Progress towards a controlled culture of the marine sponge Pseudosuberitesandrewsi in a bioreactor, Journal of Biotechnology,100(2):141–146.doi:10.1016/S0168-1656(02)00257-2. Pile, A.J., Patterson, M.R., Witman, J.D.,(1996).In situ grazing on plankton 10 µm by the boreal sponge Mycale lingua, Marine Ecology Progress Series, 141:95–102.doi:10.3354/meps141095. Pile, A.J., Patterson, M.R., Savarese, M., Chernyk, V.I., Fialkov, V.A.,(1997).Trophic effects of sponge feeding within Lake Baikal’s region. 2. Sponge abundance, diet, feeding efficiency and carbon flux, Limnology Oceanography, 42(1):178–184.doi:10.4319/lo.1997.42.1.0178. Pomponi, S.A., (1999). The bioprocess-technological potential of the sea, Journal of Biotechnology, 70(1-3):5-13.doi:10.1016/S0168-1656(99)00053-X. Reiswig, H.M., (1990). In situ feeding in two shallow water Hexactinellid sponges. In: Rützler, K. (Ed). New Perspectives in Sponge Biology.Smithsonian Institution Press, Washington, D.C., pp.504-510. Rinkevich, B., (1999). Cell cultures from marine invertebrates: obstacles, new approaches and recent improvements, Journal of Biotechnology,70(1-3):133-153.doi:10.1016/S0168-1656(99)00067-X. Selvin, J., Ninawe, A.S., Kiran, G. S., Lipton,A.P., (2010). Sponge-microbial interactions: Ecological implications and bioprospecting avenues, Critical Reviews in Microbiology,36(1):82–90.doi:10.3109/10408410903397340. Sipkema, D., Osinga, R., Schatton, W., Mendola, D., Tramper, J., Wijffels, R.H.,(2005). Large-Scale Production of Pharmaceuticals by Marine Sponges: Sea, Cell, or Synthesis?,Biotechnology and Bioengineering,90(2):201-222.doi:10.1002/bit.20404. 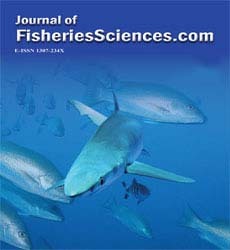 Sipkema, D., Yosef, N.A., Adamczewski, M., Osinga, R., Mendola, D., Tramper, J., Wijffels, R.H., (2006). Hypothesized Kinetic Models for Describing the Growth of Globular and Encrusting Demosponges, Marine Biotechnology,8(1):40-51.doi:10.1007/s10126-005-5002-8. Taylor, M.W., Radax, R., Steger, D., Wagner, M., (2007). Sponge-Associated Microorganisms: Evolution, Ecology, and Biotechnological Potential, Microbiology and Molecular Biology Reviews,71(2):295–347.doi:10.1128/MMBR.00040-06. Unson, M.D., Holland, N.D., Faulkner, D.J., (1994). A brominated secondary metabolite synthesized by cyanobacterialsymbiont of a marine sponge and accumulation of the crystalline metabolite in the sponge tissue, Marine Biology, 119(1):1-11.doi:10.1007/BF00350100. Vacelet, J., (1975). Etude en microscopie electronique de l'association entre bacteries et spongiaires du genre erongia (Dictyocerat-ida), Journal de microscopie et de biologie cellulaire, 23:271-288. Vieira, R.P., Clementino, M.M., Cardoso, A.M., Oliveira, D.N., Albano, R.M., Gonzalez, A.M., Paranhos, R., Martins, O.B., (2007). Archaeal Communities in a Tropical Estuarine Ecosystem: Guanabara Bay, Brazil, Microbial Ecology, 54(3):460–468.doi:10.1007/s00248-007-9261-y. Wanick, R.C., Barbosa, H.S., Frazão, L.R., Santelli, R.E., Zezzi, A.M.A., Coutinho C.C.,(2013).Evaluation of differential protein expression in Haliclonaaquarius and sponge-associated microorganisms under cadmium stress, Analytical and Bioanalytical Chemistry, 405(24):7661–7670.doi:10.1007/s00216-013-6898-x. Xue, L., Zhang, W., (2009). Growth and Survival of Early Juveniles of the Marine Sponge Hymeniacidonperlevis(Demospongiae) Under Controlled Conditions, Marine Biotechnology (NY), 11(5):640-649.doi:10.1007/s10126-009-9180-7. Yokoyama, H., Ishihi, Y., (2010).Bioindicator and biofilter function of Ulvaspp. 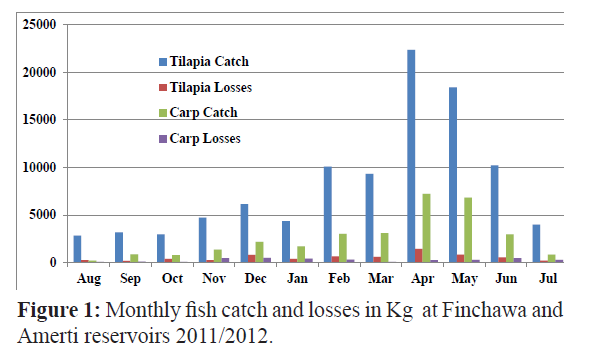 (Chlorophyta) for dissolved inorganic nitrogen discharged from a coastal fish farm– potential role in integrated multi-trophic aquaculture, Aquaculture, 310(1-2):74–83.doi:10.1016/j.aquaculture.2010.10.018.